12-track CD live from Japan featuring Deep Forest duo Michel Sanchez & Eric Mouqet. 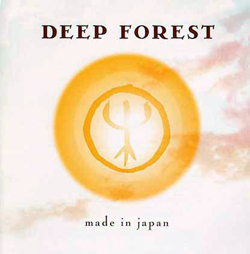 The recording took place on July 9th 1998 at Koseinenkin Hall (Tokyo), during Deep Forest’s tour in Japan, with nine musicians joining the group on the stage. The band placed an emphasis on improvisation and playing the songs differently from previous recordings Deep Forest, Boheme and Comparsa.